And after showing Noah’s proposal, he’s standing on stage with his fiance. I suspect a “safe” call is imminent. Of course there is no encore this week. Of course. And, Riker is going to the finale. Which means that either Rumer or Nastia is in jeopardy with Noah. Uh oh. Nastia and Derek’s turn. This could be trouble. Yep, Derek and Nastia in Jeopardy. Val has yet to realize that his brand of cheap shade looks good on no one. Classless. Take notes from Derek, son, then maybe you can win this show once without pimping AND a ringer. Ignorant man with little choreography chops is the worst thing I can say about you. Okay, he and Rumer are in jeopardy. Well, they just gave Nastia the chance to say goodbye. Did they talk to Riker earlier?? Come on, Len. Someone has to go home. That’s the way the show works! Wrong couple went home, but I’m not surprised. I will say that after Val’s comment tonight, I will be voting my fingers to the bone for either Noah or Riker – whoever has the best chance to beat him. I feel like I have already won DWTS just having Noah as my partner. He is my hero and a true champion. Noah deserves an award for overcoming his physical challenges and performing so beautifully each week. I have an amazing freestyle dance planned for Noah — I truly hope we make it to the final! This season is my dream come true. Thank you to all our fans for being so supportive, we love and appreciate you! More from Sharna at Closer Weekly. Well, there’s only one thing I’m reasonably certain of – Noah will make the finale. He might even win the whole damn thing and I wouldn’t be upset by that. Sharna (and CAI) did some amazing work last night. Just amazing. Riker came in a very close second to Nastia for me. His first dance was absolutely fantastic – just amazing. The judge’s choice was really not that good. Too much Julianne…who couldn’t devote enough time to it to do it justice. Which is a shame, really, because Riker is a good, entertaining dancer. Rumer had two good, solid dances but they suffered from the over hype (as is typical) by Val. It wasn’t all that, babe. I don’t even remember her first dance. Her second dance was a bit of a letdown. Interesting concept by Bruno, but I don’t think it served them that well. Both were well danced, as usual, but well danced doesn’t cut it in a semi-final where there is so much emotion. But, all that said, the scores are close enough that anyone (except Noah) could be going home. I was surprised that they actually scored the first round fairly, handing out scores that I would have handed out. Shocking. But the two points that Rumer is down may not be enough to protect Riker or Nastia. It’s too close to call. If the weakest dancer last night went home, it would be Rumer. Not that she’s weak…but I think the other three had it over her. But something tells me that they’ve successfully brainwashed the audience into voting her into the finale. Out of Riker and Nastia, I tend to give Nastia the edge. But who knows? Let’s look at the leader board. Argh. Annoying that they gave everyone a 30 in the second round, when I think that neither Riker nor Rumer really deserved it. But, as they often do when it’s close, they throw it to the audience to make the decision. Something tells me they won’t make the right one this time around. We’ll see. So, Noah is at the bottom of the leaderboard. Although I think he did an amazing, truly inspirational job this season, last night was the topper – but all that said, I would rather Rumer, Riker and Nastia go to the finale. That ALSO said, I won’t be upset with whoever goes home tomorrow night. I got Derek for ten weeks regardless….and I have a feeling that maybe the producers have finally pushed him too far, so we might not see him on this stage again. I digress. What does Noah need to make the finale?? Not much. That’s really nothing at this stage of the game and I think he makes it easily. I could be wrong. It’s always possible that one fan group or another gets over confident, or another fan group seeing that proposal knows they could be screwed. Next is Rumer. Rumer is two points ahead of Noah and two points behind Riker and Nastia. Again, not a lot of work required for her to be safe. Rumer gets 7,300 more votes per million votes cast than EITHER Riker or Nastia. That’s it. And I have no idea what will happen. For me, Rumer was the least memorable last night. She kinda faded into the woodwork. But they have a media machine going for them, in addition to the lion’s share of the actual show last night. One of them gets ONE MORE vote per million votes cast than the other. No idea what’s going to happen. But I have to make a guess. I think that Noah is passing Rumer and Riker for sure. Not so sure about Nastia, as she had the great Len tribute dance at the end of the show. I think Noah is safe. That leaves me with the other three. Based purely on demographics, I lean toward Nastia getting the one vote needed to beat Riker. Does Rumer get past her? Hard to say, but based on last night I would say no. I *THINK* Nastia might be safe. But the other half of me thinks that Derek is too big a liability these days. I can’t decide. I tend to think that Nastia gets the one vote over Riker. That would bring us down to Riker and Rumer. Rumer was more consistent last night, but Riker had the more exciting first dance. I kinda feel like the second dance let Riker down a bit. While I wasn’t overly impressed with Rumer’s second dance, I feel like it was better executed that Riker’s. Honestly, I’m leaning toward Riker going home tonight but it could be ANYONE. I won’t be surprised by whoever it is. Wow, last night’s show was one of the best shows I have ever seen in all my time watching Dancing With The Stars. The Judges Choice dances took the couples and the show to a whole new level. 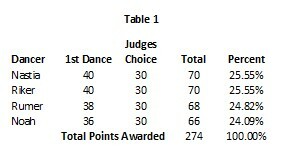 So, what do you think: Would you like to see them bring back the Judges Choice dances again in the future like I would? VOTE in our new Poll and let us know. Moving on, let’s examine the scores from last night again…. Next, how about some media? If you go to ABC, the Daily Mail, and Entertainment Tonight, you can view some beautiful photos and a special segment on Noah and his proposal. As for the interviews….first, go to E News. All four couples are interviewed on the night. It was an emotional one for them all in different ways and everyone is happy with last night’s dances. And here are some more interviews (we’ll add more interviews to each section as soon as more are released)…. Derek Hough was finally able to dance again for a complete number with Liukin after an injury marred his “DWTS” season and pro Sasha Farber had stepped in. While Hough danced most of the routine, mentor Goodman did a few moves with Liukin at the end in a performance paying tribute to the veteran judge’s life.